That was the message from English Archbishop Arthur Roche, Secretary of the Congregation for Divine Worship and the Discipline of the Sacraments, to a historic celebration of Anglican Choral Evensong in St Peter’s Basilica. 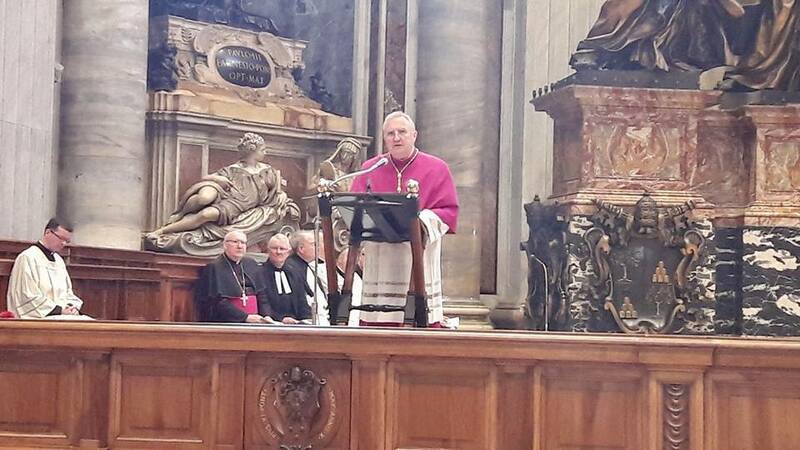 Archbishop David Moxon, director of the Anglican Centre in Rome, presided at the March 13th liturgy. The choir of Merton College, Oxford, sang motets by the English Renaissance composer William Byrd, as well as more contemporary works and some well-loved Anglican hymns. The celebration took place the day after the Church traditionally marked the feast of St Gregory the Great, who has become an unofficial patron of relations between the Anglican and Catholic Churches. St Gregory was the pope who sent Augustine, the prior of a Benedictine monastery in Rome, to evangelise the English in the year 595 AD. During the sermon, Archbishop Roche highlighted the humility and missionary zeal of Pope Gregory the Great, describing his ministry as being one of a “remarkable ecumenical nature”. Please find below the full text of Archbishop Arthur Roche’s sermon for Anglican Evensong of St Gregory the Great, celebrated at the Altar of the Chair of St Peter. We stand at a moment of historic note. Here, in this great basilica built over the tomb of St Peter on whom Christ built his Church, below St Peter’s Chair encased within Bernini’s reredos, we find ourselves in the very place where St Gregory the Great, the Apostolus Anglorum, was consecrated bishop and proclaimed Successor of St Peter and whose own tomb is nearby. The Altar that he built over the tomb of his predecessor is still used today by Peter’s successors and has born witness to some of the most important events in Church history: the inauguration of popes, the canonization of saints, an Ecumenical Council, the crowning of the Holy Roman Emperors. Few popes in history have had as great an influence on the shaping of the Church as St Gregory. Even today his teachings and example speak to us in our challenging world. He was Pope for only 14 years, but what he achieved during those years and the legacy which he left was the fruit of what he had become during the previous 50 years of his life. Besides his many qualities he was above all a disciple of the Lord – following his paths and resisting his own. He came from a wealthy patrician family in Rome, born around 540. His father, Gordianus, a Senator, was also one of the Seven Deacons of Rome and his mother, Sylvia, a virtuous woman whose sanctity is recognized in the East as well as in the West. They used their wealth and their influence for the care of others as well as in strengthening the local Christian communities by establishing monastic settlements. The home of Gregory was built on that of Nazareth, a hidden life of prayer and tenderness, yet overwhelmingly generous and hospitable. Gregory was well educated and rose to prominence within the Roman government. Highly regarded as a distinguished speaker and writer, he established himself as a person well versed in imperial law and the subjects of the day. Although he rose to the rank of Prefect of Rome, with all that this promised him, he turned instead to the monastic life of seclusion, dedicated prayer and contemplation, fasting and humble service. His talents, and even more so his character, for he was readily loved by all, could not be hidden and he was sent by Pope Pelagius II as the Pope’s ambassador to Constantinople to plead for imperial assistance to help end the suffering being endured by the great city of Rome from the ravishing diseases within and the threatening invasions without. Unsuccessful, he returned to the monastery of St Andrew on the Caelian Hill to resume a life of contemplation and study of the Scriptures. However, this would not be for long. On the death of the Pope, Gregory was elected to the Chair of Peter and after much protestation, indeed attempted avoidance, he was consecrated Bishop of Rome in the Confessio of St Peter’s now below that great Altar, on 3 September, 590. His pontificate was marked not only by remarkable administrative skills and depth of teaching, wisdom of judgement, and zeal for proclaiming the gospel everywhere, but also by outstanding pastoral care for the poor and the sick, the refugee, the slave and the criminal – care for the needs of both their bodies as well as their souls. In all his undertakings there was nothing about St Gregory that was partisan as can be seen by his rigorous restoration of the synagogues to the Jews. His direct application of the gospel was as challenging then as it is today which made him a prominent figure both spiritually and politically. Amongst his many achievements and those things for which he is remembered there are two which I think are particularly pertinent to us as the inheritors of the ministry of Gregory and Augustine today as we walk together in search of greater unity. The first can be seen in the remarkable ecumenical nature, in both the original and modern sense of that word, of his Petrine ministry. One example serves above all. At a time when other Churches were beginning to claim what was perceived as an exaggerated independence by creating distinguishing titles, St Gregory with considerable gentleness described his role as Successor of Peter as the Servus servorum Dei – the servant of the servants of God – a title retained still. It seems to me that this example serves us well. Our journey, our walking together on this pilgrimage in search of the ecumenical quest of unity invites us also to become servants one to another acknowledging that we are all unprofitable servants (Lk 17,10). Our love for each other must always be humble and unstinting. One servant encouraging another to become ever more faithful to Christ. In the end it is God’s grace which achieves that for which we work and long for, but it is Jesus Christ we proclaim and not ourselves. Triumphalism of any sort is always a wall and never a bridge. The second, and perhaps the greatest of Saint Gregory’s achievements as pope, and one in which we find inspiration today, was his missionary zeal. As we know, he sent St. Augustine, abbot of his former monastery, to preach the faith of an undivided Christendom in England. Augustine’s mission, despite initial challenges and setbacks, was so successful that it led to the later conversion of Northern Europe to Christianity. “How beautiful” indeed, “are the feet of those who bring good news,” (Isaiah 52,7). We rightly reverence those who have brought the gospel to us, who have taught us the faith by their preaching, their teaching and their holiness of life. But we must never forget, as Pope Francis recently said that, “The Church was born as outgoing. It was closeted in the refectory [till the day of Pentecost] and then came out. And it must remain in the outside world. It must not shut itself off again.” (25 November 2016) We can encourage each other in that and indeed support each other in this important imperative for all times and places. We are here below the great window of the Holy Spirit this evening which reminds us that the iconographic depiction of St Gregory is the Holy Spirit whispering in his ear. We pray that, like St Gregory, we too will remain open to the whispering of God’s Holy Spirit so that in our day we may have the courage and faith to continue praying and working to surmount the barriers that remain, to break down the walls of separation and division so that in God’s good time the unthinkable, or what seems now to be so difficult, may be made possible in Christ Jesus our Lord. The words from a letter of St Gregory to St Augustine and his fellow missionaries seem apt also for us this evening: “It is better never to undertake any high enterprise than to abandon it when once begun. So with the help of God you must carry out this holy task which you have begun. Do not be deterred by the troubles of the journey or by what men say. Be constant and zealous in carrying out this enterprise which, under God’s guidance, you have undertaken: and be assured that the greater the labour, the greater will be the glory of your reward … And although my office prevents me working at your side, yet because I long to do so, I hope to share in your joyful reward.” (St Bede’s History, Book I, chapter 23) There is no doubt that the prayers of this great Apostle of the English then, remain with us now in this holy work.